Ooooh, this will knock your socks off! If you’ve made the Biskvit cake, you know how to make the bulk of this cake. 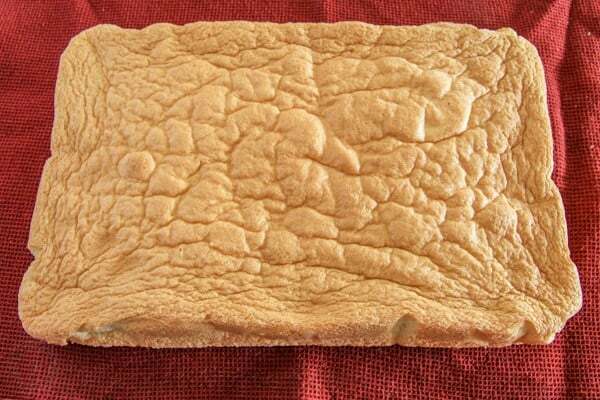 It has a special layer sandwiched between the biskvit called “byuze or beze” which is a crunchy meringue. The cakes have a unique syrup discovered by my Mama-in-law with apricots. You don’t know Ukrainian desert until you’ve tried Kiev Cake! The meringue part is quick to make, but it does take a long time to bake/dry-out and you can make it a day ahead. Ooooooh it’s so worth it! This is definitely a special occasion cake, or a “make it on a Tuesday so you can share the recipe quicker and hope your family comes over to eat it” cake. For maximum meringue crunchiness, this cake should be eaten the same day it’s assembled. 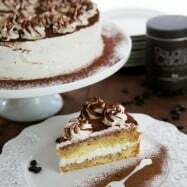 There are many different recipes of this cake, this one is my mom’s version. 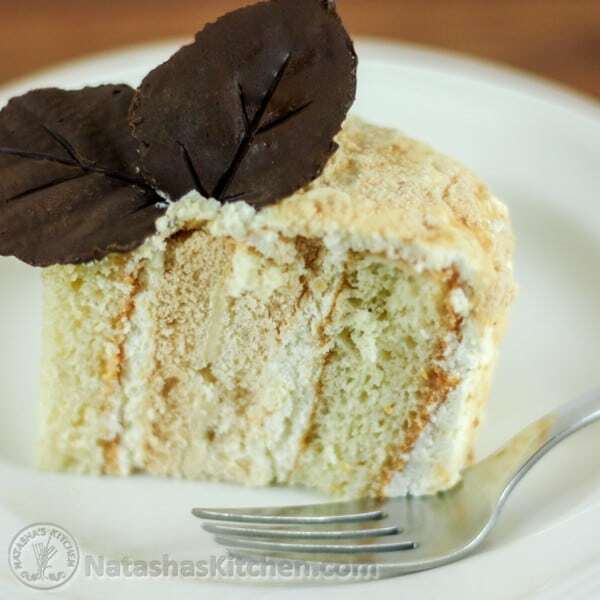 The frosting from the Russian Cherry layer cake (whipping cream and sweetened condensed milk) is also fantastic for this recipe. 1. 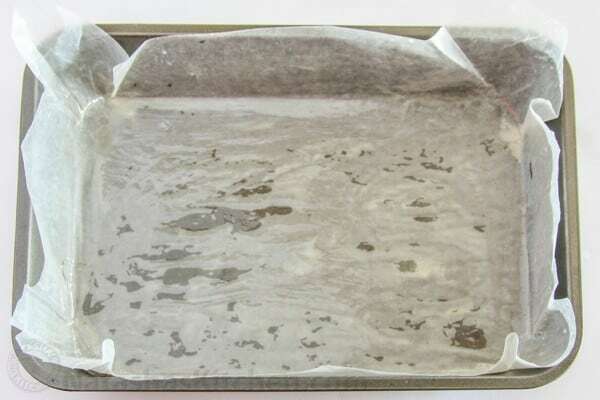 Line a 9×13 non-stick cake pan with wax paper. Melt 1 Tbsp butter and brush the top of the wax paper with butter. 2. 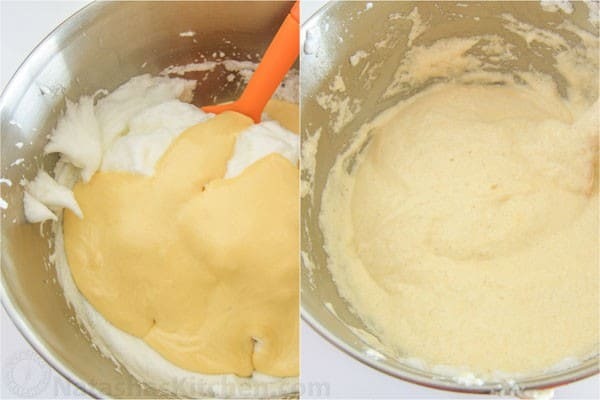 In the bowl of an electric mixer, using the whisk attachment, over high-speed, beat 6 egg whites and 1 1/3 cup of sugar together for about 6 minutes, or until stiff peaks form (see picture). It will be white and fluffy. 3. Spread the egg whites evenly into the cake pan lined with wax paper. Bake at 250˚ F for 4 hours and 10 minutes. When the time is up, remove from oven and peel off the wax paper. Set on a tea towel and cool to room temperature. The Meringue can be left on the counter overnight, covered with a dry tea towel. 1.Preheat the Oven to 350˚ F and line 1 non-stick cake pans with wax paper. Use a (13×9) non-stick pan. 2. First, separate egg whites from yolks. 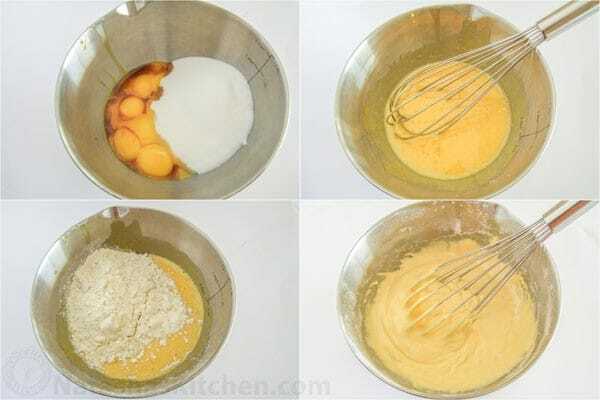 Next, in a medium bowl, whisk together 8 yolks, 3/4 cup of sugar and 1 tsp vanilla. Add 1 cup of flour until well blended. 3. In a large bowl, beat 8 egg whites on high-speed until they foam and are about 3-4 times in volume (about 2 1/2 to 3 minutes). Don’t beat too long or you will begin to lose volume. 4. Use a spatula to gently fold the yolk mixture into the egg whites until well combined. Don’t mix too much or you will lose volume. The batter should have a fluffy texture. 5. Place the batter into the lined cake pan and bake 22 minutes until the top is golden. 6. As soon as the cake is done, turn the cake out onto a clean surface and peel off the wax paper. This is much easier to do while the cake is still very warm. Use a knife to remove rough edges. Let cakes cool to room temperature. 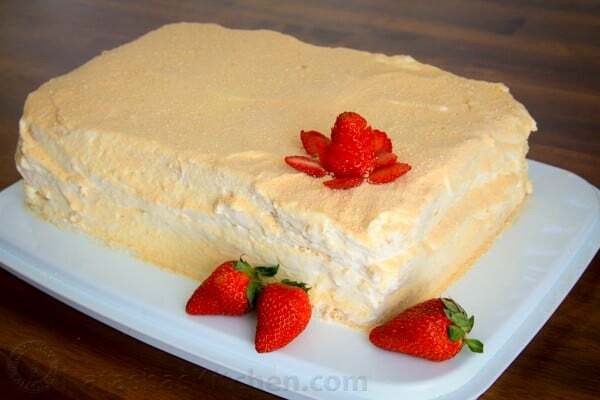 (note: for maximum crunchiness of the meringue layer, this cake should be eaten the same day it is assembled). 1. Drain the apricots reserving the syrup. Mix all of the syrup ingredients (drained apricot syrup, 1/4 cup water, 1 tsp lemon juice, 1 Tbsp sugar) together until sugar dissolves. Puree Remaining Apricots in a Blender. 2. Slice the cake evenly into two layers. Place the first cake layer(with the cut side up) on the dish you will be serving it on. Once you put the syrup on, it will be very difficult to move it. 3. Pour half the syrup evenly over the first cake layer and spread half of the apricot puree over it. 4. Spread about 1/4 of the frosting evenly over the puree. 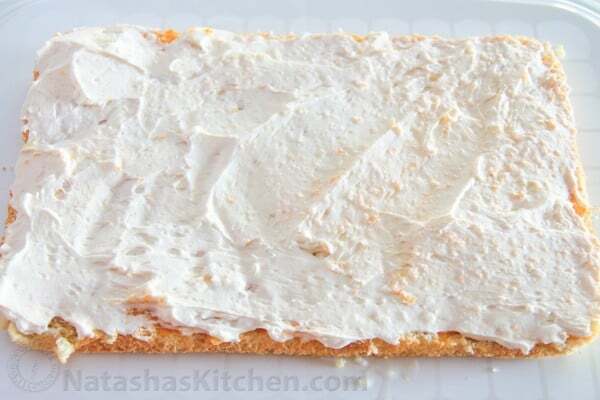 Click here for Russian Cream Cheese Frosting Recipe that I used. 6. Place the second cake on top of the meringue . Pour the second half of syrup evenly over the second cake and spread the rest of the apricot puree on the top. 7. Frost the top and sides of the cake. 8. Crush the meringue crumbs and Sprinkle them all over the cake. It helps to hold a spatula next to the side of the cake as you sprinkle crumbs to keep more of them on the cake. Or you can use a fine mesh sieve if you have one for more even distribution. You may need to tilt the cake a little to cover the sides, just do this cautiously. 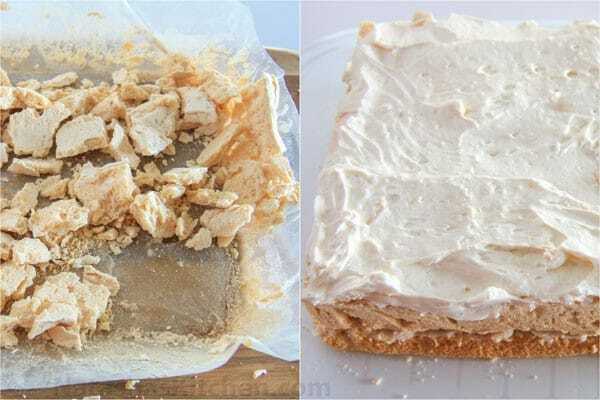 Notes: The final layers should be: cake, syrup, puree, frosting, meringue, frosting, cake syrup, puree, frosting on all sides, covered with meringue crumbs. Refrigerate cake until ready to serve. It stays yummy in the fridge for a few days. 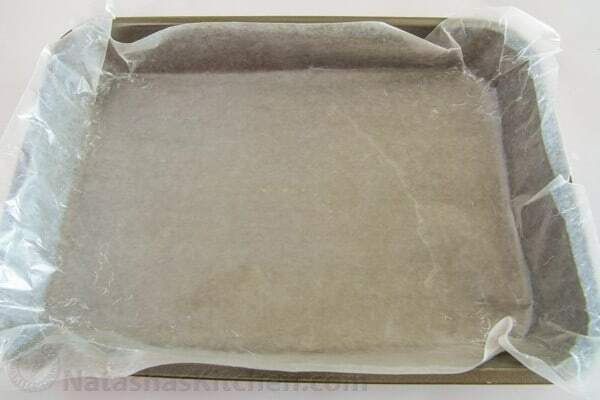 Line a 9x13 non-stick cake pan with wax paper. 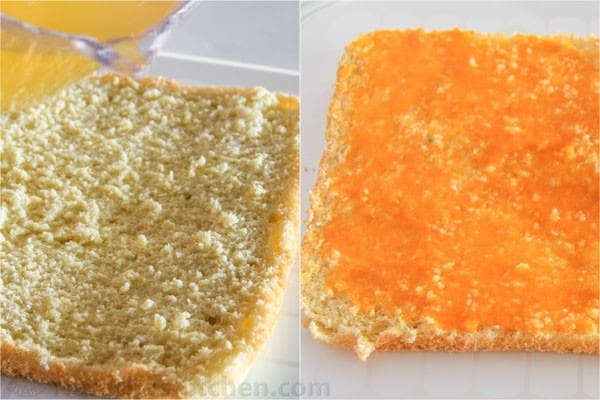 Melt 1 Tbsp butter and brush the top of the wax paper with butter. 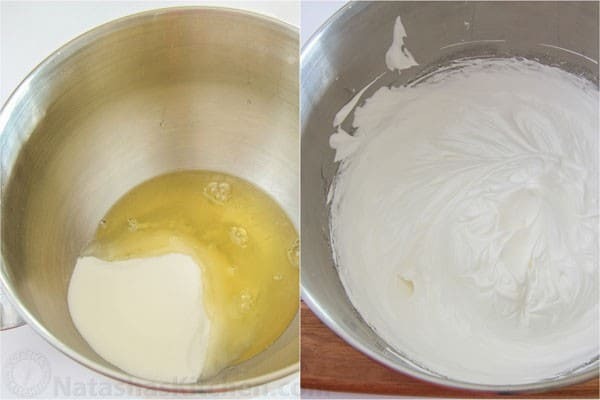 In the bowl of an electric mixer, using the whisk attachment, over high-speed, beat 6 egg whites and 1 1/3 cup of sugar together for about 6 minutes, or until stiff peaks form (see picture). It will be white and fluffy. Spread the egg whites evenly into the cake pan lined with wax paper. Bake at 250˚ F for 4 hours and 10 minutes. When the time is up, remove from oven and peel off the wax paper. Set on a tea towel and cool to room temperature. The Meringue can be left on the counter overnight, covered with a dry tea towel. Preheat the Oven to 350˚ F and line 1 non-stick cake pans with wax paper. Use a (13x9) non-stick pan. First, separate egg whites from yolks. Next, in a medium bowl, whisk together 8 yolks, 3/4 cup of sugar and 1 tsp vanilla. Add 1 cup of flour until well blended. In a large bowl, beat 8 egg whites on high-speed until they foam and are about 3-4 times in volume (about 2 1/2 to 3 minutes). Don't beat too long or you will begin to lose volume. Place the batter into the lined cake pan and bake 22 minutes until the top is golden. As soon as the cake is done, turn the cake out onto a clean surface and peel off the wax paper. This is much easier to do while the cake is still very warm. Use a knife to remove rough edges. Let cakes cool to room temperature. Assembling the Cake: (note: for maximum crunchiness of the meringue layer, this cake should be eaten the same day it is assembled). Drain the apricots reserving the syrup. Mix all of the syrup ingredients (drained apricot syrup, 1/4 cup water, 1 tsp lemon juice, 1 Tbsp sugar) together until sugar dissolves. 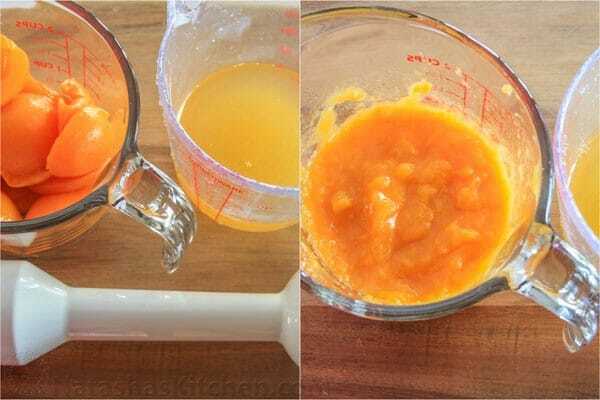 Puree Remaining Apricots in a Blender. Slice the cake evenly into two layers. Place the first cake layer(with the cut side up) on the dish you will be serving it on. Once you put the syrup on, it will be very difficult to move it. Pour half the syrup evenly over the first cake layer and spread half of the apricot puree over it. Spread about 1/4 of the frosting evenly over the puree. 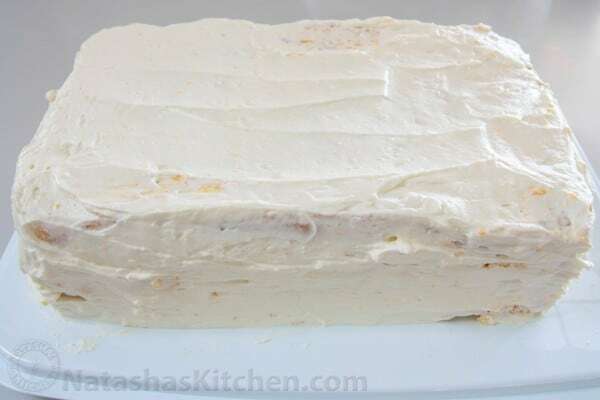 Click here for Russian Cream Cheese Frosting Recipe that I used. Set baked meringue over the cake and trim it to fit evenly over the biskvit cake. Reserve Crumbs for the top of the cake. 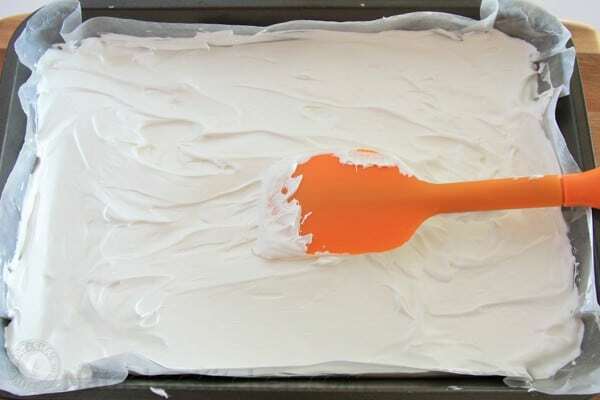 Place the meringue on top of cake and spread frosting over the top. Place the second cake on top of the meringue . Pour the second half of syrup evenly over the second cake and spread the rest of the apricot puree on the top. 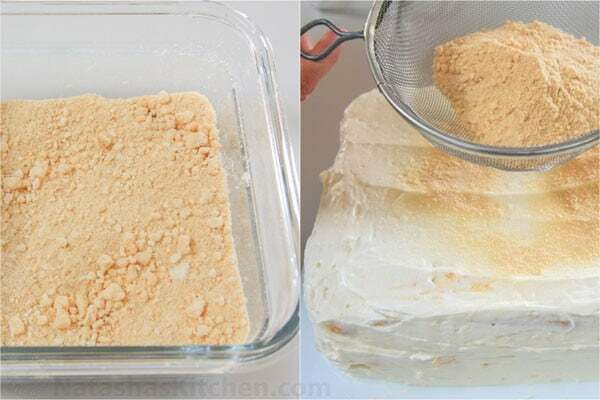 Crush the meringue crumbs and Sprinkle them all over the cake. It helps to hold a spatula next to the side of the cake as you sprinkle crumbs to keep more of them on the cake. Or you can use a fine mesh sieve if you have one for more even distribution. You may need to tilt the cake a little to cover the sides, just do this cautiously. 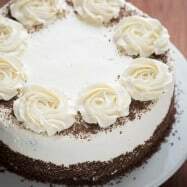 The final layers should be: cake, syrup, puree, frosting, meringue, frosting, cake syrup, puree, frosting on all sides, covered with meringue crumbs. Refrigerate cake until ready to serve. It stays yummy in the fridge for a few days. Awesome! Ok one more, I accidentally grabbed peaches instead of apricots 🙄 Do I do same procedure? Or should I use an apricot jam I have here at home? So far the beze came out perfect! The cake is in the oven! Everything is going smooth. Excited to taste it! HI Sarah, the peaches could work but I think apricot jam would work as well. I’d probably go with the jam 🙂 I hope you love the cake! It was probably not the best choice of recipe for a wedding cake, but I don’t do this enough to know that and they asked for it, lol 🙂 Do you think if I put the cake into the freezer (all done & decorated with fondant on top) until tomorrow, that it would preserve the meringue? Or would it ruin the cake? Thanks so much! I’ve never frozen a meringue before but I’m pretty sure it wouldn’t be good since it would introduce moisture into your meringue which would soften it. Did you use a buttercream frosting under the fondant? I made this cake!!!! I liked it soooo much!!! Yes, otherwise your cake would be ridiculously tall and probably wouldn’t rise properly. For the biskvit cake portion, actually these proportions would work perfectly in a 9-inch round cake pan: https://natashaskitchen.com/2011/03/06/russian-tiramisu-recipe/ <-- follow the baking instructions for the cake portion from this link also. Just want to thank you for your blog and the time you put into testing & perfecting the recipes! 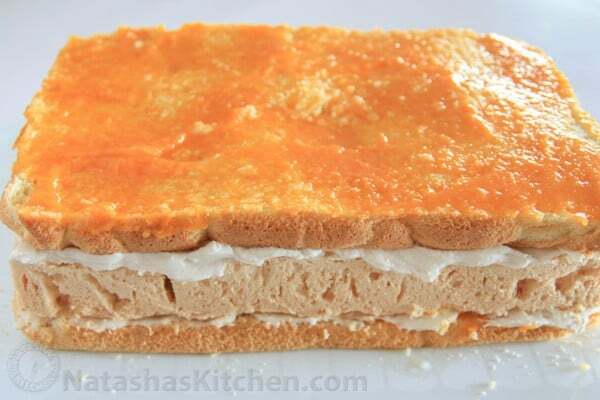 Thanks for the recipe and great instructions – it was delicious – fun to make a Russian Cake as we head into Olympics!!! Sorry for the typo…..I tried to correct. Ukraine and Russia are not the same countries, not counties. Thank you again! This is NOT kievskiy Tort! Its a DELICIOUS CAKE, but it is NOT authentic Kievskiy Tort AT ALL. not even close!! I made this cake a few days ago and it turned out so good. Though it was a lil too tall for me. Do you think its possible to reduce the buze, as in use half the eggs but still pour into the 9 by 13 pan? Just to make it shorter in height? 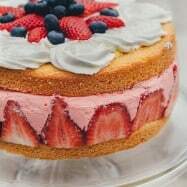 Making this yummy cake this weekend for the first time. Very excited, sounds very tasty. step 7. 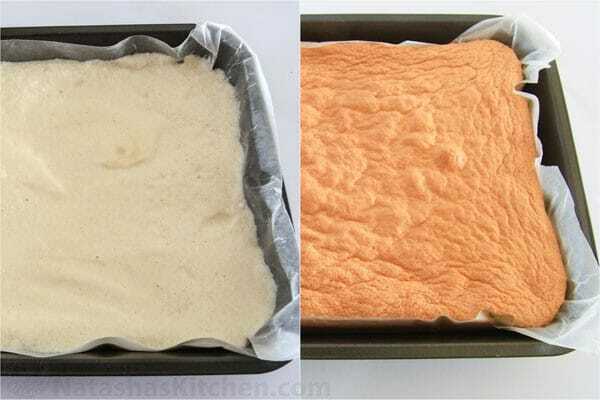 ( cake prep) Divide the batter evenly among the two, lined cake pans. step 2. 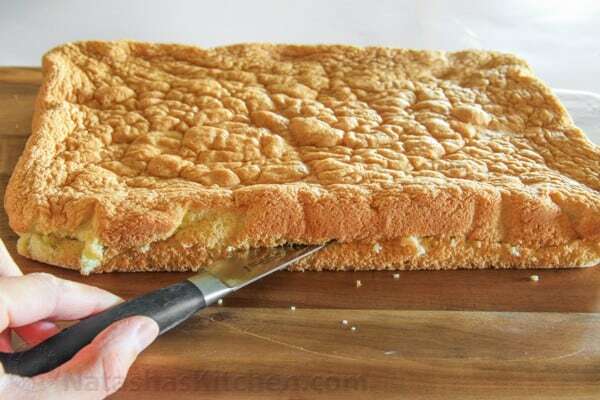 ( cake assemble) Slice the cake evenly into two layers. 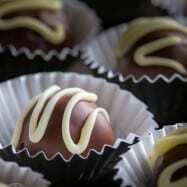 Would a glass pan work for a cake? I don’t have a cake pan in that size. Or I could use 2 square pans and make smaller cakes. If I do, would I have to bake the cake for a shorter time? http://chadeyka.livejournal.com/tag/%D0%B1%D0%B5%D0%B7%D0%B5 (may be you’d like this blog also); assembled and decorated. Taste even better than trye Kievsky. Is the syrup from the can, reserved? Do i use it in addition to the water and lemon listed? I had this cake at my Sister-In-Law house and making it today for a party this weekend. But the Beze looks a lot shorter then her was…Did I do something wrong? Is it still ok to finish the cake or should I remake the Beze? Hey, this recipe looks awesome- I’m planning on making it for a Eurovision party on Saturday, I drew Ukraine, and I’m hoping they get through to the final. 🙂 I was just wondering, for the biskvit, what sort of flour should I use? I normally make cake with self-raising, but they don’t look very large, so should it be plain? Thank you for the recipe. I made this cake last week for my neices 15th B-day party. I modified the layers a little bit and used 2 cans of apricots since my cake was 12 iches in diameter. I did beskvit-apricots-frosting-beze-frosting-apricots-beskvit, I did it that way so I can cover the whole cake with frosting and cover it with fondant. The cake turned out so yummy and very pretty. Also for those who wanted to add some nuts to the recipe I sprinkled the bottom of my pan with little bit of nuts and then put beze on top so that way it didn’t effect how my beze came up. Also FYI-for those who have problems with beze falling apart or cracking when cutting it or taking out of the can- there is a spice called “Cream of Tartar” by McCormick- it is to be added to Meringue recipes- this is perfect because my beze came out perfect and didn’t fall apart when cut. I added about 1/2 teaspoon to your recipe. Give this a try. Thanks again for the awesome recipe. 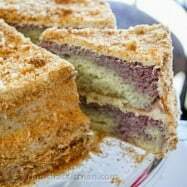 I’m planning on making this cake this weekend, I was just wondering should there be nuts in “Kievskiy” cake? Do you think I could add hazelnuts to the Beze? I would image it should still work. Natasha, nuts have a pretty good content of oil in them. Depending on what type you use, some may experience a problem with their beze. The oil may contribute to a flat beze. I’m not a chemist, but it makes sense to me. Maybe that’s the problem with the nuts and the egg whites? Natasha……..this cake looks amazing. 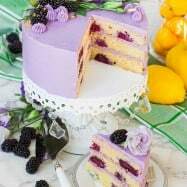 I’ve tasted this cake once before but have never made one yet. This looks so good.